California’s Proposition 8, the controversial anti-gay-marriage measure that was fought furiously on both sides for several months and included Tricycle Press’s children’s book King & King as a negative spin in supporters’ TV commercials, won a stunning victory on November 4 in the state’s election. Gay writers responded to the win with outrage, concern and heartbreak. John Rechy, the Los Angeles-based PEN International Award-winning gay author expressed a sense of outrage and betrayal by the passing of Prop. 8. Noting what he called fear tactics used by its backers in their ads, Rechy said, “Of course it helped Prop. 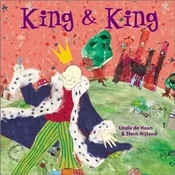 8 to use a harmless children’s book (King & King) about gay marriage in its campaign of minority intolerance. My fear now is that all of gay literature will be more closely scrutinized, and that free speech will become even more endangered.” Rechy and his partner of more than 30 years were recently married. Although the head of the California Teacher’s Association stated on many occasions during the campaign that marriage is not taught in schools, Prop. 8’s supporters seemed to state otherwise in their ads that used King as an example of what information children would be privy to if gay marriage was not banned in California. Charles Flowers, executive director of the LAMBDA Literary Foundation that supports the gay, lesbian, bisexual and transgender book communities, noted the complexities that lie ahead because of this misinformation. “The use of a children’s book definitely worked in Prop. 8’s favor,” he said. “Now that it’s passed, these people have instilled a lot of fear in the minds of parents about text adoptions and gay-themed books in schools. This will put gay teachers under much more scrutiny as well.” Flowers is also concerned about the legal limbo the passing of Proposition 8 has put California’s 22,000 married gay couples in. Novelist Christopher Rice, president of the board of the LAMBDA Literary Foundation, is well aware of the power of the written word. “The image of a kid holding a book (about gay marriage) is profound. Unfortunately, the backers of Prop. 8 used King as an example of how a young mind can be corrupted, rather than how it can be opened.” Rice also blames the measure’s backers for using the book in a dishonest way, saying it’s opened a “psychic wound” in gay writers everywhere who are on the frontlines of unfiltered and candid information about the way they live their lives.